Kerry James Marshall is an artist who takes matters into his own hands. Like Lonnie Holley and David Hammons, Marshall would agree that there is a huge dearth of art that accurately and justly depicts the African-American experience in the United States. So what do artists do when they encounter this problem? Make art about it, of course! Oh, and also add a healthy dose of glitter – because, why not? 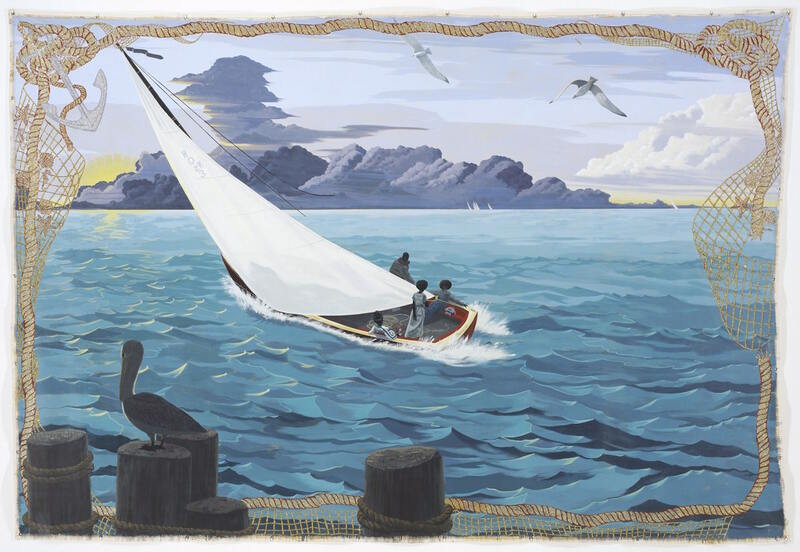 In this case, Marshall transforms a well-known painting – Winslow Homer’s 1899 The Gulf Stream, which is part of the collection at The Metropolitan Museum of Art – to remark on the authenticity of Black experience. Many contemporary artists look back at the art-historical canon to locate its absences and erasures, and trust me, there are plenty to go around. What’s so refreshing about Marshall’s art is that doesn’t make you feel uncomfortable when you look at it. Gulf Stream is nowhere near comparable to the weirdness that is Yasumasa Morimura’s Portrait (Fugato), which is a gender-bending rendition of Manet’s Olympia. In doing so, Marshall normalizes the presence of the Black figure in Western art history, which is something the field is desperately lacking. In Winslow’s enigmatic version, a solitary Black figure appears to be way too chill about being stuck in a broken-down boat in the middle of dangerous, shark-infested waters. This disastrous scene is seriously straight out of one of my nightmares. With a pretty bleak take on the figure’s situation, scholars have interpreted Homer’s painting as a depiction of contemporary racial tensions in the United States. But what did Homer really know about this? Although he might have been sympathetic, he was still a white man trying to depict the Black experience. As a child of the Civil Rights era, Marshall was aware of the construction of Black identity from an early age. This is why, in his version, the Black figures are not helpless victims. Instead, they’re the heroes of their own story. Marshall’s Gulf Stream figures are a far cry from the man who seems to accept his hopeless situation. In fact, they’re enjoying a pleasant day out on the water, boombox included. Two of the figures also rock some pretty sweet afros, which have long been associated with Black pride and political resistance and of which artist Mickalene Thomas would definitely approve. Dawson, Jessica. “Kerry James Marshall.” Art in America. November 15, 2013. http://www.artinamericamagazine.com/reviews/kerry-james-marshall/. Accessed July 20, 2017. Hoel, Jeanne. Kerry James Marshall: Mastry, Classroom Curriculum Guide. Education. The Museum of Contemporary Art, Los Angeles. https://www.moca.org/storage/app/media/Education/KJM_ClassroomCurricGuid.... Accessed July 20, 2017. Stamberg, Susan. “Kerry James Marshall: A Black Presence In The Art World Is ‘Not Negotiable.’” NPR. March 28, 2017. http://www.npr.org/2017/03/28/521683667/kerry-james-marshall-a-black-pre.... Accessed July 20, 2017. The Metropolitan Museum of Art. The Gulf Stream. Collection. http://www.metmuseum.org/art/collection/search/11122. Accessed July 20, 2017. The Museum of Contemporary Art, Los Angeles. “Kerry James Marshall: Mastry.” https://www.moca.org/exhibition/kerry-james-marshall-mastry. Accessed July 20, 2017. Walker Art Center. Gulf Stream. Collections. 2017. https://walkerart.org/collections/artworks/gulf-stream. Accessed July 20, 2017.